Side effects to medication are not uncommon. However, drug allergies are rarer and occur when a person’s immune system sees a drug or the metabolite of a drug as something harmful and an inappropriate defence reaction is mounted. These defence reactions can involve different arms of the body’s immune system (eg IgE mediated vs delayed T cell responses) and complex mechanisms. The symptoms that someone develops as well as the appearance of a skin rash can help to determine what mechanisms of reactivity might be involved which in turn can help dictate what type of investigation is required. 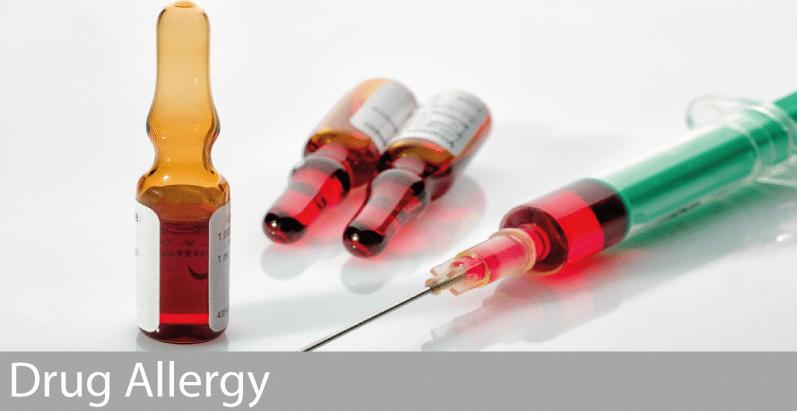 Skin prick tests, intradermal tests, patch tests and oral challenges may all be used to identify if such a drug allergy exists or not.